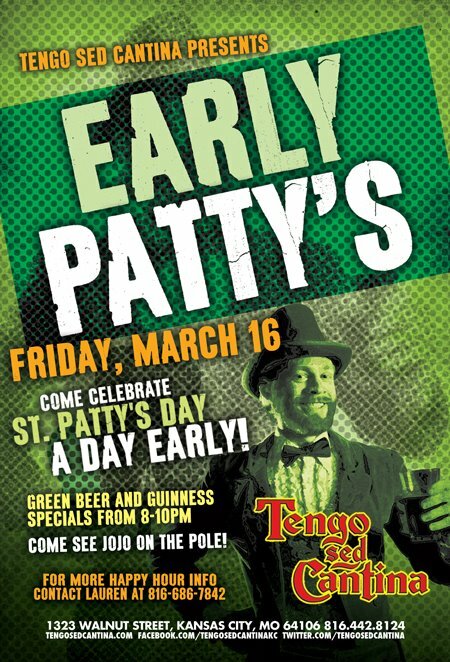 Tengo sed Cantina is holding an Early Patty’s Party this Friday, March 16, 2012. Admission is free if you arrive before 10:00 p.m. You must be 21+ to attend. This event includes Guinness specials and green beer. The party starts at 8:00 p.m.
For more information, call 816- 442-8112. Tengo sed Cantina is located at 1323 Walnut Street in the Kansas City Power & Light District.